Does the bacterial community associated with vine weevil enable its insect host to adapt to different environments? Vine weevil, Otiorhynchus sulcatus Fabricius (Coleoptera: Curculionidae), is a pest of a wide range of horticultural crops. In the last century, this pest has spread almost globally from its central European native area. Furthermore, it has been recorded developing successfully on more than 150 different host plant species. Adult individuals feed on leaves causing cosmetic damage, whereas larval stages feed on the root system reducing plant vigour and causing plant death. Damage caused by this pest for the UK soft fruit industry is estimated to be £10 million/year. 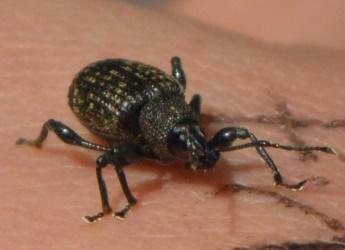 Vine weevils are triploid females which reproduce asexually. Although this type of reproduction renders individuals weaker to adapt and to face changes compared to sexual reproduction, it has not hampered the spread of this pest almost worldwide. Thus, the capability of vine weevil populations to colonize such a wide range of environments and host plants suggests that another mechanism may be important in explaining the success of this species. Previous studies have shown that bacteria living symbiotically inside insects can benefit their insect hosts in different ways, such as providing them with nutritional benefits or defence against parasitoids and pathogens. Pilar Morera Margarit (Ecological Sciences) will discuss how symbiotic bacteria could be playing an important role in adaptation of vine weevil to environmental conditions and interactions with natural enemies. To test this hypothesis, she will discuss a characterisation of the bacteria present in larvae, pupae, adults and eggs of individuals collected in different areas throughout the UK, and on different crop and non-crop plant species, using state-of-the-art Next Generation Sequencing tools. Additionally, performance studies will compare the adaptation ability and the susceptibility to natural enemies of bacteria-free insects and individuals carrying bacteria. Therefore, future results will unravel the importance of bacterial symbionts for vine weevil fitness, which can be used to devise and contribute for a more efficient and sustainable pest control methods. For further information, please contact Jenni Stockan, Environmental & Biochemical Sciences, James Hutton Institute, Craigiebuckler, Aberdeen, AB15 8QH, UK. Office: +44 (0)1224 395 239, or Jennifer Slater, Ecological Sciences, James Hutton Institute, Invergowrie, Dundee, DD2 5DA.